Part 31 of Wonders of World Engineering was published on Tuesday 28th September 1937, price 7d. Part 31 includes a colour plate showing the “Coronation Scot” leaving London at the start of the test run on June 29, 1937. It formed part of the article on Britain’s Streamlined Expresses. The colour plate was also reproduced on the cover of this part. 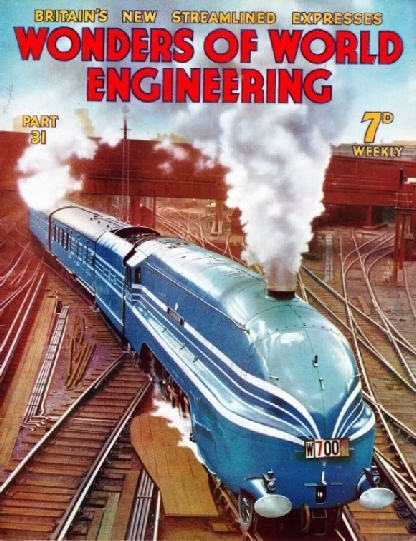 The cover of this week’s part shows one of Britain’s latest streamlined trains, “The Coronation Scot”, leaving Euston Station on an experimental run to Crewe, before being put into regular service. On this occasion, a speed of nearly 114 miles and hour was attained. An article on Britain’s Streamlined Expresses appears in this part. Telephonic communication is now possible between London and almost every country in the world. A vast network of wore and radio links is controlled from Faraday Building, London, which has become the nerve-centre of world communication. In this Exchange all telephone calls from Great Britain to countries abroad and overseas are dealt with. Ingenious electrical mechanism records the length of telephone conversations, automatically deducting the lengths of periods in which conversation is interrupted for any reason. The chapter is by Howard Barry. A new chapter in British railway history was written in the summer of 1937, when streamlined express trains began to run between England and Scotland. 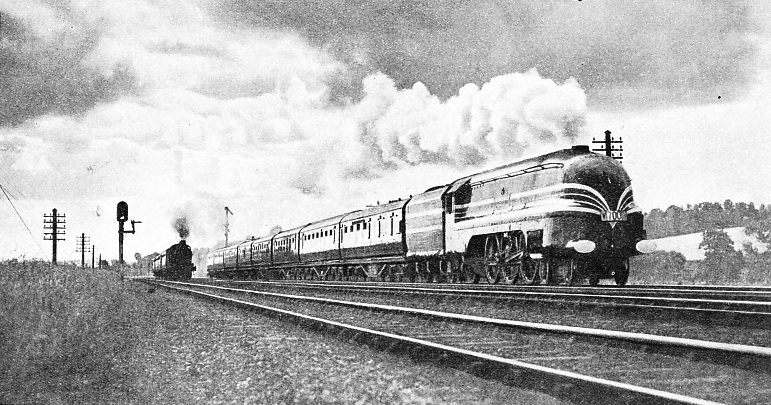 The LNER express “Coronation” reached Edinburgh in six hours from King’s Cross; by the “Coronation Scot” of the LMS, Glasgow was put within six and a half hours of Euston. Some readers are particularly interested in speed records, whether on land, on sea or in the air. On railways, both in Great Britain and abroad, progress has been so rapid in recent years that speed records, like ninepins, are set up only to be demolished. Speed alone has its fascination; speed allied to luxury makes an irresistible appeal. Such an alliance is to be found in the new streamlined expresses of the LNER and LMS Railways, which began running between London and Scotland on July 5 of this year . The successful operation of such trains as these depends on the co-operation of many different branches of engineering. The locomotives have to be specially designed, the rolling stock must be built to stand continuous high-speed running, and the track must be realined and kept in perfect condition. The LNER “Coronation”, which runs between King’s Cross and Edinburgh in six hours at an overall average speed of 65.5 miles an hour, and is the fastest train in the British Empire, strikes a new note in its appointments and equipment. The aim of the designers, as well as providing a high degree of comfort, has been to combine the advantages of the open vestibule car and of the separate compartment. In addition, there is a “beaver tail” observation car. The LMS train, “The Coronation Scot”, includes open vestibule cars and compartment vehicles. The interiors of the coaches are a study in cabinet work. One car in each set has been veneered in Canadian silver elm cut from the piles of the recently demolished Waterloo Bridge, over the Thames. “The Coronation Scot” travels between Euston and Glasgow, 401.4 miles, in six and a half hours, at an average speed of 61.7 miles an hour. Powerful streamlined locomotives are entrusted with the haulage of these expresses. For the LNER trains new engines of the well-known A4 Pacific class are used. For the LMS trains, new Pacifics, modifications of the record-breaking Princess Royal class, have been built. The first of these, No. 6220 Coronation, set up several new records on a test run on June 29, 1937. On the down journey the locomotive, hauling 270 tons gross, maintained a speed of 100 miles an hour for ten miles, reaching a momentary “peak” of 114 miles an hour. On the return journey the unprecedented average of 79.7 miles an hour was kept up all the way from Crewe to Euston. The LNER test run on the following day provided a top speed of 109½ miles an hour with a heavier train. Cecil J. Allen, who was among those who recorded these epoch-making runs, is the author of this chapter which describes the trains and the locomotives that haul them. Cecil J. Allen has had a lifelong experience as a writer on railway subjects, and my readers may rest assured that the chapter will be full of interest to expert and layman alike. This chapter is supplemented by a striking colour plate of “The Coronation Scot” leaving Euston Station on its test run to Crewe and back. This is the third article in the series Marvels of Modern Transport. 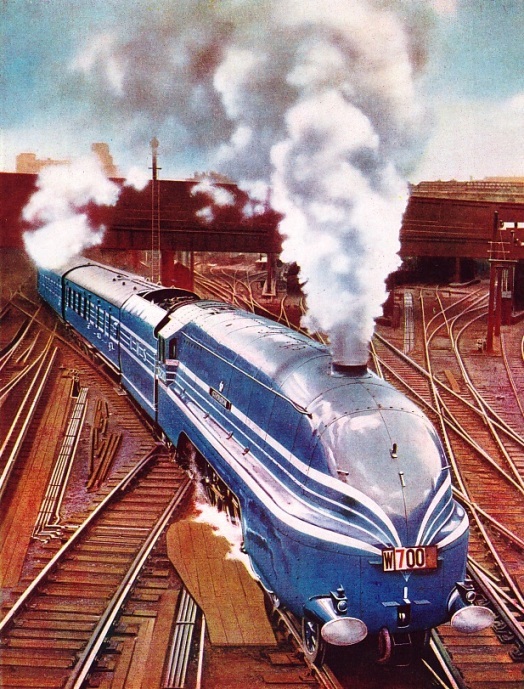 “THE CORONATION SCOT” on its record-breaking run of June 29, 1937. For this test one kitchen car was taken off the train, the load behind the tender being eight coaches, totalling 270 tons gross. On the down journey from Euston to Crewe No. 6220 Coronation, hauling the train, averaged 100 mils and hour for ten miles on the descent from Whitmore (Staffs), and reached a momentary “peak” of 114. On the return journey the unprecedented average of 79.7 miles an hour was kept up over the 158.1 miles from Crewe to Euston. TEN CONCRETE SPANS of 180 feet and two of 100 feet carry the Delaware, Luckawanna and Western Railroad across Tunkhannock Creek, near Scranton, Pennsylvania. The viaduct has a total length of 2,375 feet, including approaches, and it towers 240 feet above the river. The viaduct contains 167,000 cubic yards of concrete and 1,000 tons of reinforcing steel. Apart from their intrinsic value as precious stones, diamonds are of almost inestimable worth to the engineer, for they are indestructible and will cut their way through the toughest steel and the hardest stone or rock. This chapter, by Dr Malcolm Burr, describes the remarkable ways in which diamonds are used in engineering. Diamonds are used for hardness testing machines, which test the degree of hardness of metal parts which are subject to wear and tear or stress, for cutting glass and porcelain, for fine engraving, for dressing emery wheels, and for many other purposes. This chapter will describe also diamond mining in South Africa. The article is concluded in part 32. The story of the construction of the first telephone line across America. The chapter is by Harold Shepstone. The article is concluded from part 30. 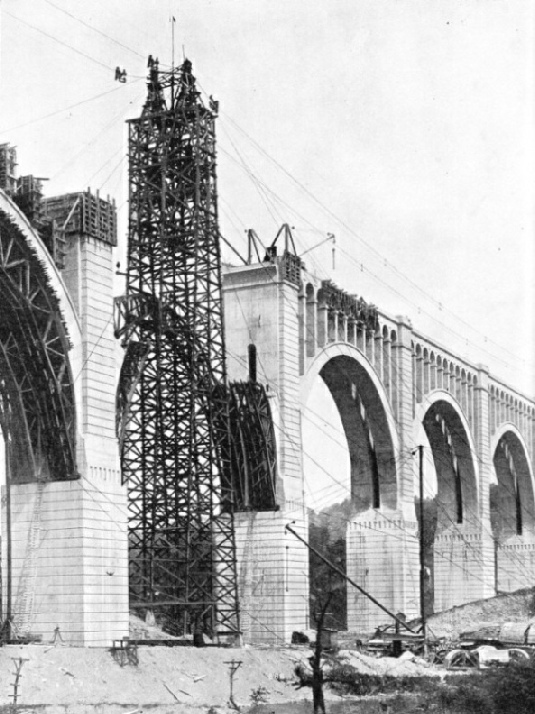 In an extensive scheme of reconstruction, the Pennsylvania, USA, between 1904 and 1914, a daring step was taken when it was decided to use concrete for most of the work. 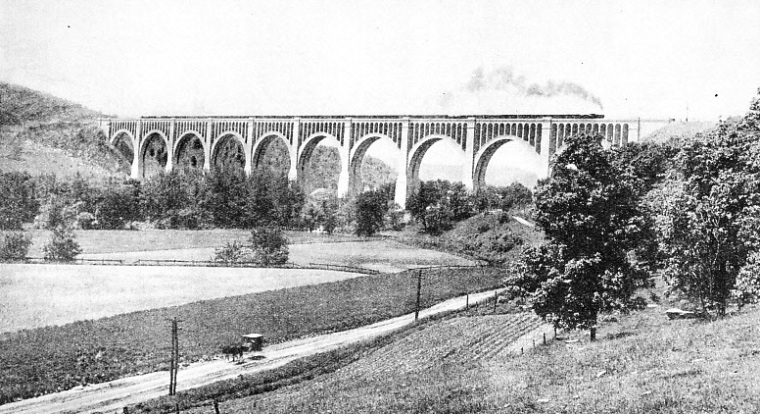 Tunkhannock Viaduct is claimed to be the largest concrete viaduct in the world. This chapter is by Harold Shepstone. AT THE START OF THE TEST RUN on June 29, 1937, “The Coronation Scot” leaving London. The engine is No. 6220 Coronation, the first of the five streamlined Pacifics built in 1937 for the haulage of high-speed trains on the LMS. On the test run Coronation, with 270 tons gross behind the tender, ran from Euston to Crewe, 158.1 miles, in 2 hours 9 minutes 46 seconds, at an average speed of 73.1 miles an hour. The return journey was completed in an overall time of 1 hour 59 minutes from start to stop. These times were respectively 5¼ and 16 minutes ahead of the special schedule of 2¼ hours. In the summer of 1937 “The Coronation Scot” was booked to cover the distance in 2 hours 24 minutes in either direction in the course of its non-stop runs between Euston and Carlisle. Although at first he had practised law, William George Armstrong, who became a peer in 1887, was always interested in engineering. His first success was in the field of hydraulic power transmission and he invented the hydraulic accumulator. His later activities extended to the designing and making of ordnance. 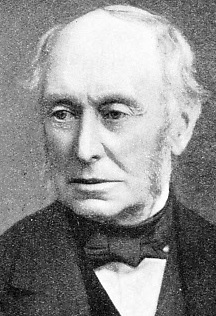 The name of Armstrong is perhaps not so unfamiliar to most people as that of other engineers, for it forms part of the designation of well-known firms still in existence; but probably only few know exactly what part William George Armstrong, afterwards Lord Armstrong, played in engineering history. Armstrong, born at Newcastle-on-Tyne on November 26, 1810, spent his boyhood in circumstances of comfort and culture, his father being a man of considerable attainments and taking a prominent part in local affairs. The boy had the usual grammar school education of his times, but, apart from a characteristic interest in mechanical toys and models, there is little to record of these early days. Having left school, Armstrong was articled to a solicitor, and until 1847 was engaged in what was to him the uncongenial practice of law. His spare time, however, had long been spent in amateur engineering, amateur only in the sense that he did not gain his livelihood by it. Attracted by that branch of engineering which had been neglected since its possibilities had been visualized by Bramah in 1802, namely hydraulic power transmission, Armstrong designed and built the first multiplying crane, which was erected at Newcastle Quay in 1846 The novelty and success of the machine attracted much notice and engineers from all parts of the world came to see it. In 1847 Armstrong abandoned law and joined a small engineering firm at Elswick, on the banks of the River Tyne. Hydraulic machines had become an asset to the nation and orders came in at a great rate. One of the firm’s earliest installations was for hydraulic cranes, at Trafalgar Goods Station, Newcastle. Up to then power in any considerable amount was derived from steam, and it was not always convenient to have a boiler and steam engine at every point where power was wanted. Power could, however, be transmitted simply and quietly through pipes by means of water pressure. At first the pressure available in the ordinary water mains was used, though supplemented in some instances by the building of water towers to give a sufficient head. This practice had some drawbacks, one being that the pipes and cylinders used had to be large if the pressure was low. Armstrong, therefore, set about to devise some other means of obtaining water at higher pressure. The result was the invention, in 1851, of that immensely useful apparatus the hydraulic accumulator. The accumulator is a large vertical cylinder containing a ram heavily loaded by scrap iron or other weighty material. Water is pumped into the cylinder and the ram rises. The cylinder is connected to that of the crane, press, capstan engine or other hydraulic machine concerned, and when movement is required from this the weighted ram forces the water out of the accumulator at high pressure to it. As the movement of hydraulic machines is generally intermittent the supply of water in the accumulator is sufficient to run them as long as wanted, the pump starting to refill the accumulator when the ram is nearing the bottom of its stroke. At a pressure of 700 lb per sq in the consumption of two gallons of water a minute will produce one horse-power, and pressures of more than twice this are common. The invention of the accumulator further consolidated the firm’s position and hydraulic machinery continued to be developed and manufactured, but the events of the Crimean War (1854-56) led Armstrong into another field of engineering, that is, the making of ordnance. At that time the smoothbore muzzle-loading gun of cast iron or bronze was in general use in the British forces, On shipboard this type of gun, mounted on a wooden carriage, was considered to have reached its maximum size if it weighed 95 cwt. The heaviest ball weighed 94 lb and the biggest charge of powder was 16 lb. Armstrong developed a rifled, breech-loading gun which during his lifetime reached 110 tons in weight, firing a projectile of 2,000 lb and using a charge of 960 lb. Briefly, the Armstrong gun consisted of several concentric tubes shrunk one over the other. At first Armstrong advocated wrought iron and became involved in numerous controversies with Bessemer, Whitworth and others over the use of steel, which had been adopted by Krupp and which he eventually used also. Armstrongs, Ltd. The name survives also in the firm of Sir W G. Armstrong, Whitworth & Co. (Engineers) Ltd, of Newcastle-on-Tyne. The earlier title preserved here marks the knighthood bestowed upon Armstrong on the presentation of his gun invention to the nation. In the Jubilee year of 1887 he was raised to the peerage. The list of professional and academic honours bestowed upon him is long. In the same way as many other successful engineers, he spent a large part of his wealth on philanthropic objects, and Newcastle owes two public parks and much else to him. In his later days Lord Armstrong was greatly interested in cattle breeding and agricultural pursuits and lived simply until December 27, 1900, saw the quiet end of a busy and useful life. This is the eleventh article in the series on Makers of Engineering History. RADIOTELEPHONY SWITCHBOARD at Faraday Building, London, with which the great transmitters at Rugby are connected. 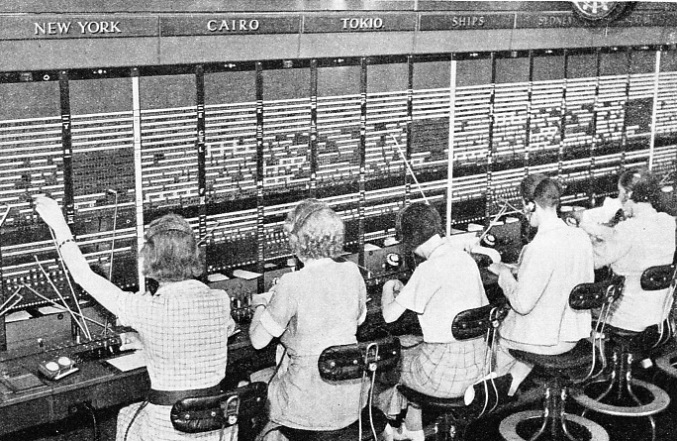 The row of names above the switchboard is a testimony to the enormous range of the modern telephone system. On the left is a double stopwatch used for timing the conversations; one of the watches is stopped during periods of interference. 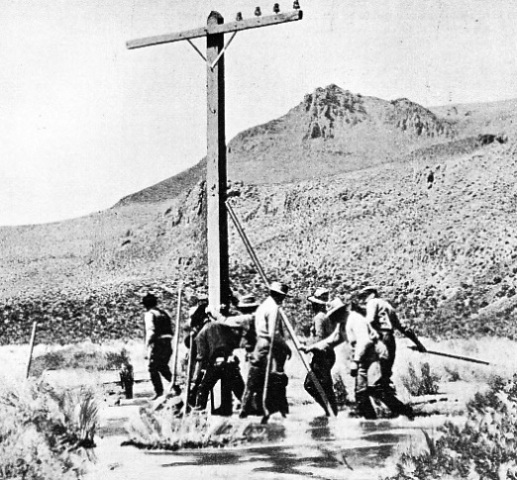 POLE SETTING IN A SALT SINK near Stone House, about sixty miles east of Winnemucca, Nevada. The pole was pushed into a vertical position, with its base in the hole previously excavated, by the men in the construction gang. When the pole had been set, with cross-arms fixed and insulators attached, linemen fixed the wires. Sometimes the ground was so hard that it had to be blasted to take the poles. A HUGE TIMBER TOWER, 260 feet high, was erected in the centre of Tunkhannock Creek to support the cableway used for handling the building material. The two terminal towers of the cableway were 3,028 feet apart. The central tower measured 40 feet by 60 feet at the base. IN THE ERECTING SHOP at Crewe Works, LMS Railway. No. 6220, Coronation, the first of a new class of high-speed Pacific locomotives built for the London-Glasgow service, is seen above partly streamlined. On the extreme left is the smokebox of the second engine of the class. Five of these streamlined locomotives were built by the LMS in 1937. 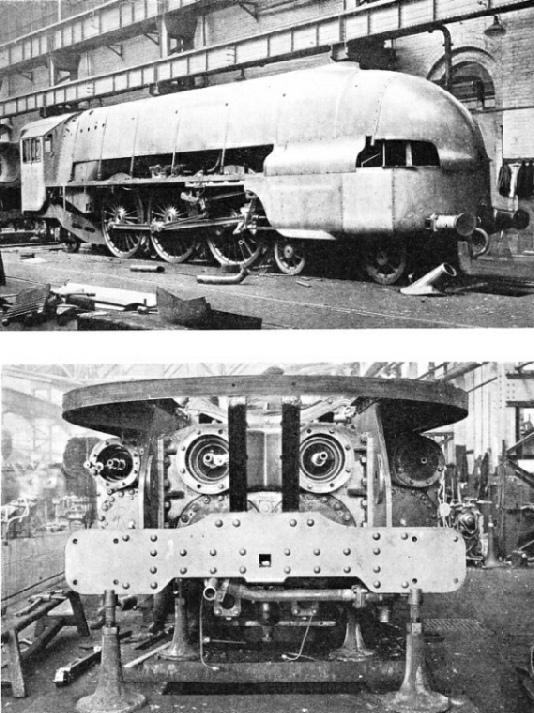 FRONT END of LMS streamlined Pacific No. 6220, showing the four cylinders, the steam chests and the upper framing. Each of the LMS Pacifics of this class has four single-expansion cylinders 16½ in diameter by 28 in stroke. 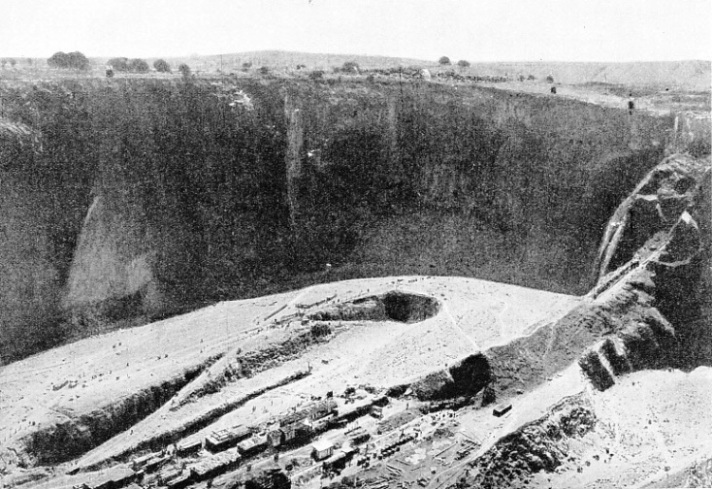 THE PREMIER DIAMOND MINE was opened about twenty-five miles east of Pretoria, Transvaal, South Africa, in 1902. Work was started on the open cast system. By 1913, 10,000,000 loads of ground had been removed and yet the surface had not been lowered by more than 30 feet. Most of the South African mines eventually adopted underground workings.